I was looking through my old sketchbooks from art college and uni and they were filled with a variety of colourful sketches using all different medias. There was an old fashion sketchbook where I had to explore texture and colour of a dragonfly and use these qualities in my final clothing designs. I used coffee and inks, sparkly papers, wax crayons, foil and netting with a dusting of glitter! Although my drawing and illustrations have improved dramatically from then my sketchbooks are filled with cute characters and ideas but are missing that touchy feely characteristic of my old sketchbooks that were filled so much they wouldn't close. I love my neat and monochrome sketches and when I look at them I can see them in colour in my mind's eye. This is ideal for first draft sketches to clients. So I decided that I need to add some colour into my drawings and sketchbooks. Not all obviously as I love my pencil work. Just every now and again I'd like to so some quick, colourful sketches as my full colour work in acrylics can be time consuming! 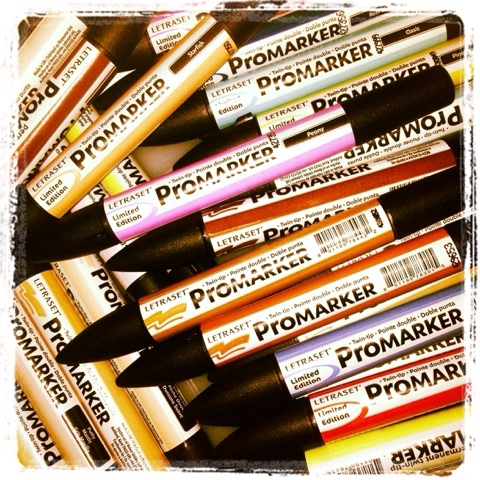 So I opened my parcel and it felt like Christmas with all my new promarkers. I've never used them so I'm going to have some fun getting to grips with blending them and making some quick colourful sketches.